2008 is over, it’s time to start the new season of “rendez-vous” with a second edition of SHARE, the multimedia jam session open to all! SHARE Bru invites to improvisation between sound, visual and performing artists interested in digital and interactive media (but not exclusively!). 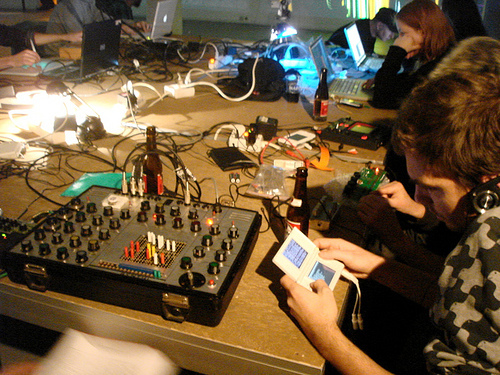 So, bring your laptop, sensors, synthesizers or any other digital interface that can be used to share signals. Plug your gear into our audio and video mixing boards and be a part of the experiment with the other participants. If possible, bring your audio or video cable to join! Of course, you can come to dance and perform with your body on the pictures and sounds! More info on SHARE here! Check pics and videos from the last SHARE Bru!